Learn the proper grip, stance, starting position and finish technique to consistently throw softball strikes. 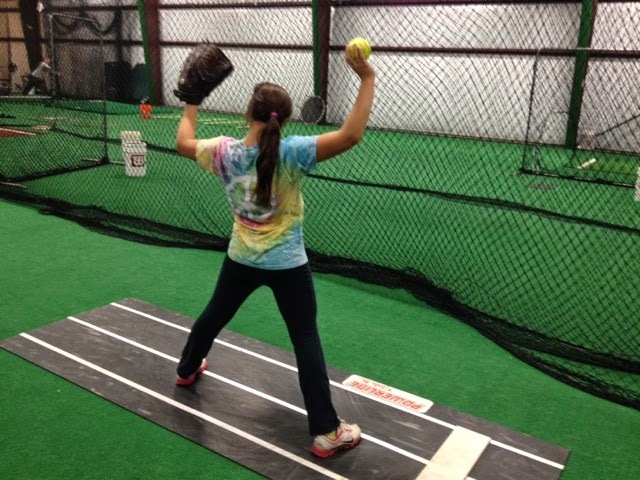 As a parent or coach of a new fastpitch softball pitcher, you may find pitching tips for a beginner confusing. To make things simple, I thought I'd lay out the most basic information you need to get your new pitcher throwing strikes. 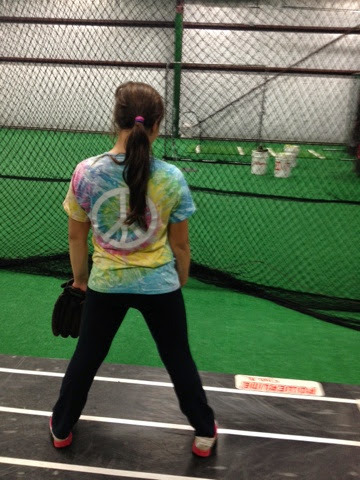 The first pitch to learn is the fastball. There are two types: a four-seam fastball and a two-seam fastball, named based upon how many seams you see if the ball is spinning toward you. The four-seam will be your fastest, most consistent pitch and the only fastball you should be concerned with as a beginner, until you can throw strikes 60 percent of the time. The two-seam will have some movement with little or no speed variation from the four-seam. The grip used and the direction of movement will vary from pitcher to pitcher, depending on speed, hand size and speed of spin. The two-seam is normally not a "go-to" pitch like the four-seam, but it will be a good second strike or strikeout pitch. Stick to the four-seam when you need a strike. Pictured below is the four-seam fastball grip. There are four "C's" on the ball—two forward and two backward. Find one and place your fingers on the top part with the opening facing to the side. Stretch your thumb back so it is in line with your middle finger. Your pinky can be tucked or lightly resting on the side but not actually gripping the ball. Place the pads of your fingers on the seam for a secure grip. Curl your fingers slightly so they are not fully touching the ball. The "curl" is a major factor in generating spin on the ball. 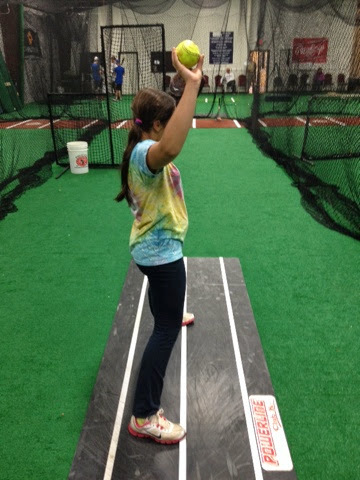 Foot placement on the mound keeps a pitcher balanced and in control of her motion. 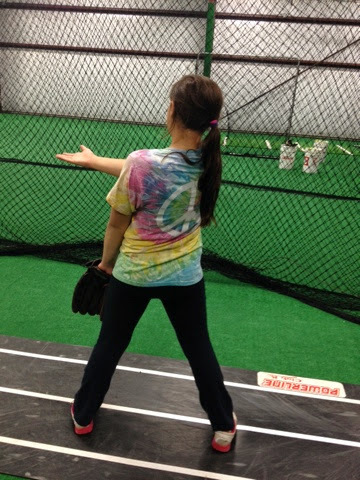 Your feet should be about shoulder-width apart, slightly staggered, with the forward foot on the throwing arm side. 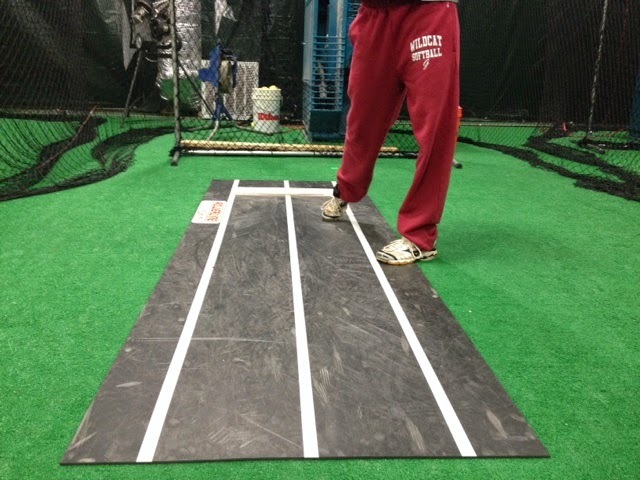 If you are a beginner, your best chance to throw a strike will be to place your front foot in the center of the rubber with your heel in contact with rubber. Your glove-side toes should be in contact with the rubber but not extend beyond it. The pictures below illustrate illegal foot placements, foot placements that will lead to balance problems, and then proper legal foot placement. 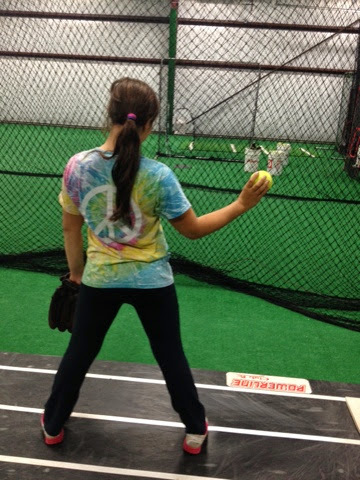 All pictures are for right-handed pitchers. Since different leagues and divisions have different rules for legal foot placement, I use NCAA pitching rules to cover every division. The power line starts in the middle of the mound and ends at the point of home plate. Your stride leg should always land on the power line with the toe pointed at a 45- to 90-degree angle in relation to the power line. For beginners, the goal is 90 degrees with hopes the toe lands somewhere between 90 and 45, since the 45-degree concept is sometimes difficult. The objectives here are pitch direction pitcher balance. Where you step is typically where you throw, and you should always step toward the target. Balance is related to body control. When a pitcher gets off-balance, her brain takes over her body and tries to remain upright by using her arms to offset body leans. When this happens, the pitcher temporally loses control of her arms, which makes throwing strikes nearly impossible. Below are examples of a pitcher starting and landing on a power line, and a few examples of not stepping on the power line, which can cause balance problems. 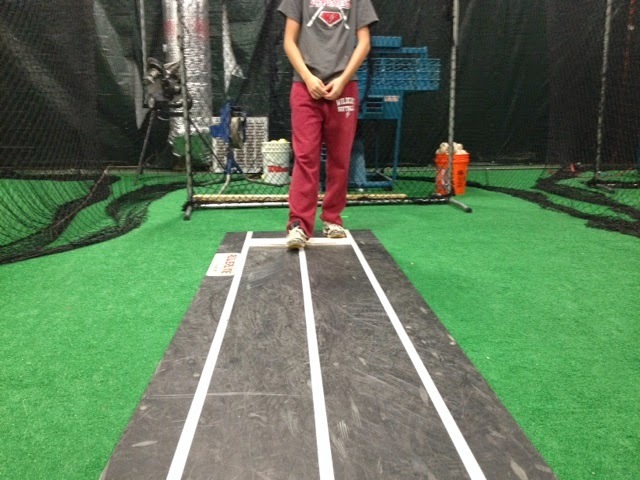 Notice in the fourth picture, she is stepping to her far left and lands outside the pitching lane (width of the rubber). This is illegal for NCAA pitchers. Stride length should be as far as you are tall. Walk heel to toe and try to land between your fifth and sixth step. If you are not striding long enough, try kicking harder with your stride leg. The X position has many names: power position, K position, 12 o'clock position. Whatever name you choose, this is the strike position because once you get into this position in your motion, strikes are easy. From your feet up, land on your power line with your toe pointed between 90 to 45 degrees. Glove hand and shoulders are also on top of the power line. The palm of your throwing hand is pointed away from your body, the arm circle is on top of your toes, and your arm is long but not locked. You will have a noticeable bend in your arm, and your body is upright with your head facing the target. 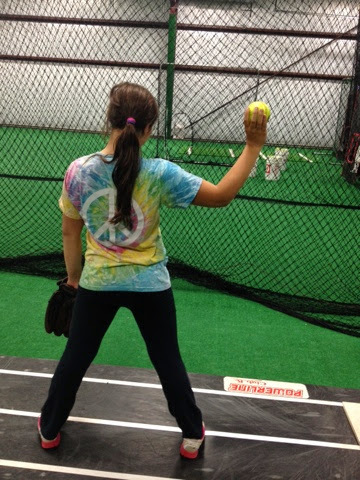 The pictures below show a pitcher in her X position and also shows her arm circle slightly in front of her body in line with her toes. Start with your arm relaxed. The release point is the place where you let go of the ball to throw a strike. 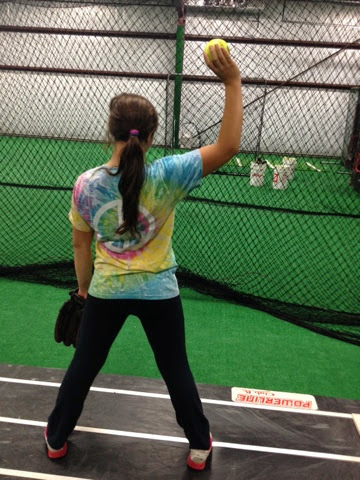 Your arm whip increases your release point range and allows you more time to release the ball and throw a strike. The best way to feel the arm whip is from the X position. Pull down from the elbow and push your hand toward the target, reach toward the target, and completely relax your arm on release. The pictures below show an exaggerated arm whip. The last part of the pitch is the release, which is a simple finger roll that creates ball rotation. The best way to practice the spin is to toss the ball up and create spin with your fingertips. 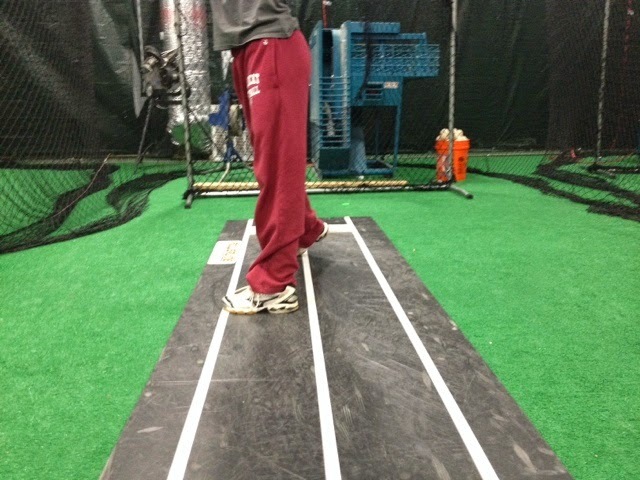 This is a very light and easy motion that, when done correctly, will create a drop motion on all pitches. There are two ways to finish: staying sideways or turning to face the catcher. I have taught and found success in both, but I typically teach a sideways finish—no rotation on the stride leg, knees pinched together, and arms finishing in a scissor motion (opposite directions but both along the power line). This technique is more difficult to learn but makes it easier to throw straight. Finishing facing the target requires a pivot on the stride leg and the arms finishing in a helicopter motion. This finish may be easier to learn than the sideways finish, but it makes it more difficult to control strikes. Whichever way you decide to finish, you must do two things: finish the same way every time and complete the pitching motion before the catcher catches the ball. Spins. Toss ball up to yourself, about 2 feet, focusing on increasing spin. Do a minimum of 500 per week. 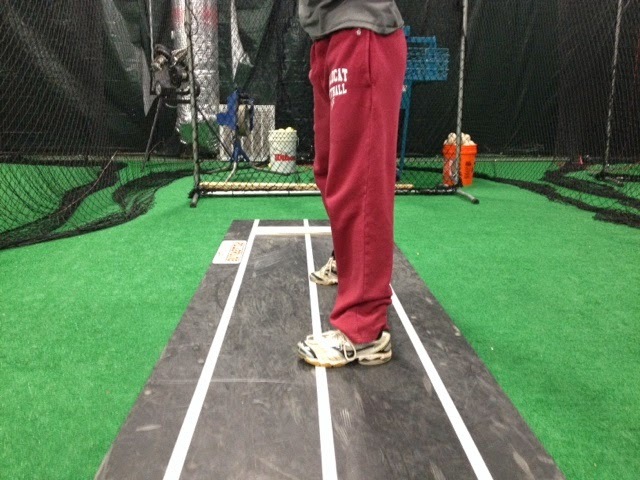 Power line/Stride/X Position. Practice striding and landing on the power line and stopping in the X position. This is best done on a board that's 8 feet long and 6 inches wide to promote balance. Do 300 - 500 per week. Arm Circle/No Legs. Start with your feet in the X position on the power line. Practice the arm circle and keeping the ball over your toes. Remember to spin the ball to the target. Do not step or lean until there's a noticeable improvement in control. Allowing for high repetitions and low intensity, this drill is key to learning to throw strikes. Full motion. The best way to learn is to do. Practice the full motion as often as possible, but don't force the motion if you're not ready. It can lead to poor mechanics and potential injuries later. To progress but limit chances of developing poor mechanics, start each practice with 10 balls. Let the pitcher throw, but if the pitch is not catchable, do not chase it—just pick up the next ball. Throw until you run out of balls and then be done for the day. Count the total pitches and try to improve each day. Over-practicing with bad mechanics can be counterproductive. Do this a minimum of three times per week until your total pitch count reaches about 50.